Hi, everyone! Happy holidays! 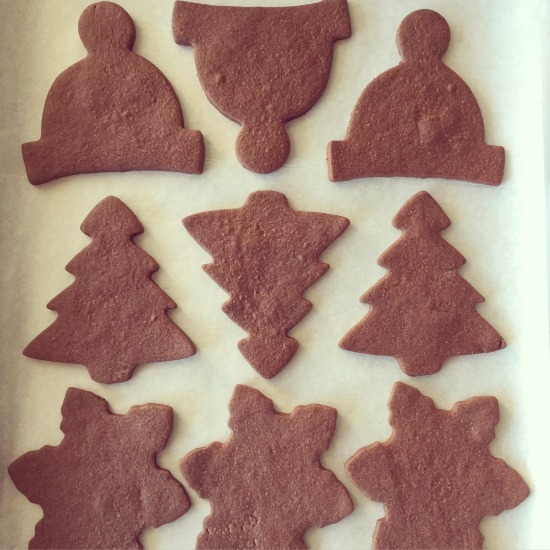 Like most food bloggers, my month of December turns into one long baking and cooking marathon . If you’re looking for me this month, I am likely in the kitchen, sprinting around the grocery store like a contestant on “Supermarket Sweep” (don’t you miss that show and its ridiculous 5-pound blocks of cheese? ), or running around the house, trying to prevent a certain toddler from taking every last ornament off of our Christmas tree. And, occasionally, I am able to wash my hair and carve out a few precious hours for sleep. This “workout routine” is the perfect antidote to all of my holiday taste-testing, now that daily trips to the treadmill aren’t as, well, daily. It’s baffling how constantly following someone who has just learned to walk (and who walks like a drunken sailor) makes you feel like you have been chasing Usain Bolt around the living room and up and down the stairs. It also makes me grateful for those twice-daily naps (hers, not mine….sigh), when I get my baking done. Granted, I’m still dancing around two dogs who are hoping for a dropped scrap of gingerbread, but at this point I’ll take what I can get. 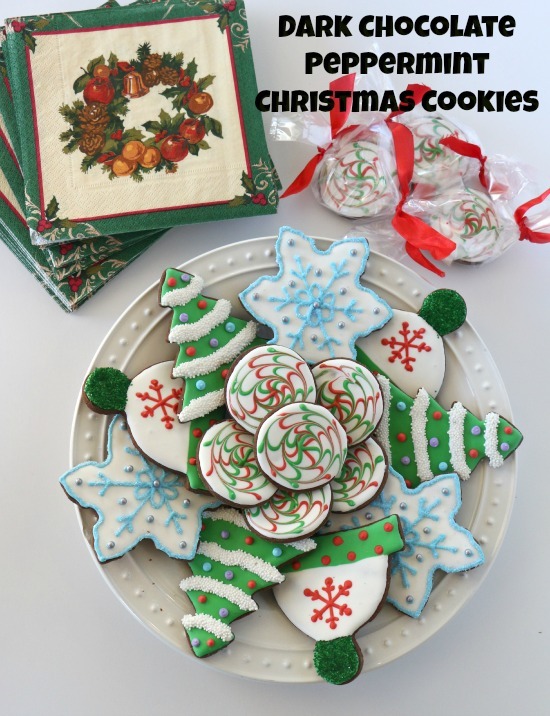 Today’s post and recipe are a result of the annual Food Blogger’s Cookie Swap, an event (created by Julie of The Little Kitchen and Lindsay of Love and Olive Oil) in which food bloggers exchange homemade cookies with other food bloggers across the country. Each blogger is provided with three matches, to whom they send their original creations in early December. 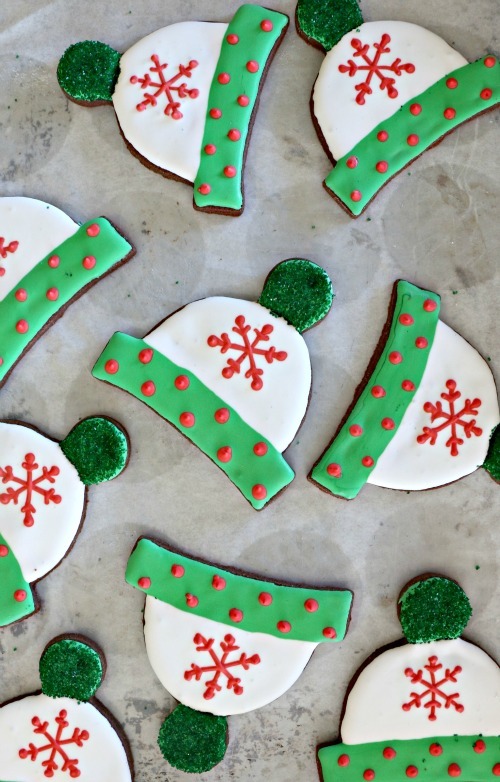 It’s such a fun concept, and it’s a great way to kick off my marathon Christmas baking season, especially since it benefits a great charity: Cookies for Kids Cancer. 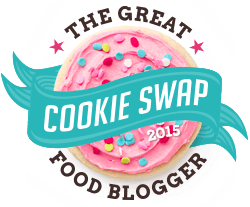 If you’re interested in participating next year, be sure to check of their web site: Food Blogger Cookie Swap. 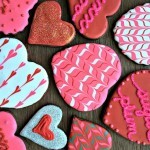 This year, I couldn’t decide on one cookie, so I made two different cookies for my blogger matches. 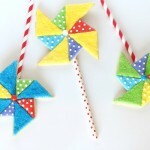 This first one is a twist on my traditional vanilla-orange sugar cookies, which are usually the ones that I decorate. This recipe features the classic flavor combination of dark chocolate and peppermint, which is perfect for the holidays. 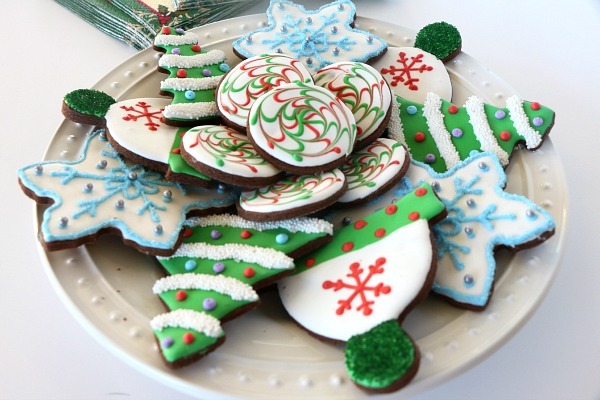 The rich, deeply chocolate cookies are complemented by a bright and sweet peppermint glaze, which I tinted and piped onto festive holiday shapes. 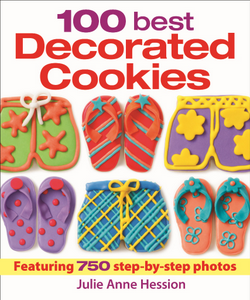 Once decorated and dried, I carefully packaged up the cookies so that they would arrive in one piece, and I sent them off to my matches. Hopefully, the USPS was kind to my creations. Coming soon: My second #fbcookieswap cookie: another chocolate-peppermint combination, and a result of my indecisiveness. 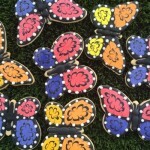 Thank you to all of my matches for sending such creative and delicious cookies. They were devoured, quickly!! 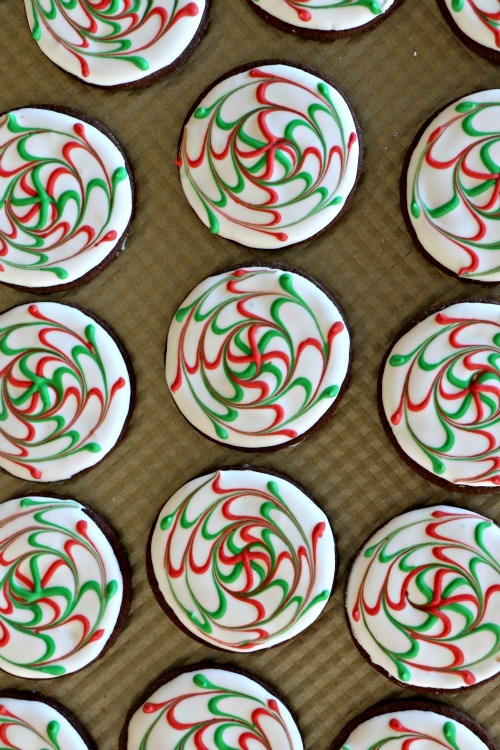 Chocolate and peppermint is a classic holiday flavor combination. In this twist on classic sugar cookies, dark chocolate cut-outs are topped with a bright, sweet peppermint-y glaze. 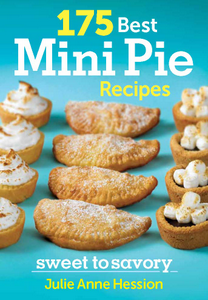 These are certain to be a hit with friends, family, and Santa! In the bowl of electric mixer fitted with the paddle attachment, beat butter and sugar at medium speed until light and fluffy, about 3 minutes. Beat in eggs, one at a time, beating well after each addition, then beat in vanilla. On low speed, gradually add flour mixture to the bowl, mixing until combined. Turn dough out onto a work surface and divide into three equal pieces. Shape each piece into a flat disk. Wrap each disk tightly in plastic wrap. Refrigerate for at least one hour and up to three days before using. Preheat oven to 350°F (180°C), placing racks in upper and lower thirds positions. On a lightly floured work surface, roll out one disk of dough to a thickness of 1/4-inch (.5 cm). 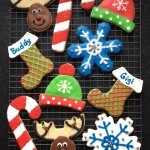 Using cookie cutters, cut out desired shapes and carefully transfer them to prepared baking sheets, spacing apart. Reroll scraps as necessary. Repeat process with remaining disks of dough. 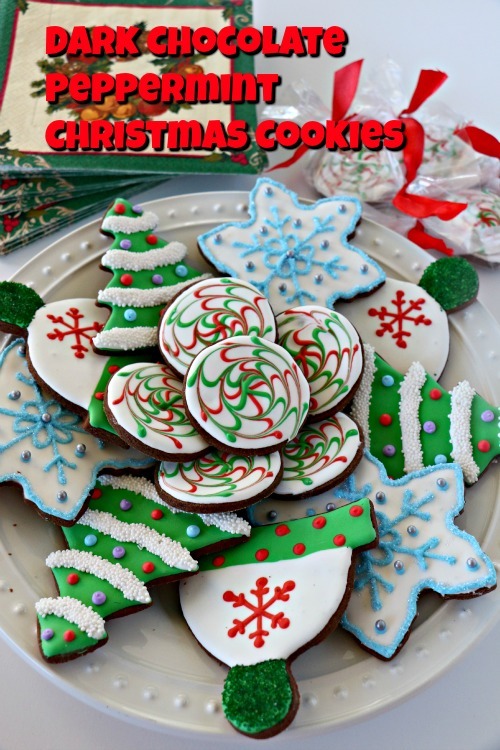 Bake cookies in your preheated oven 11 to 15 minutes, switching positions of baking sheets halfway through, until cookies are set and very lightly browned. 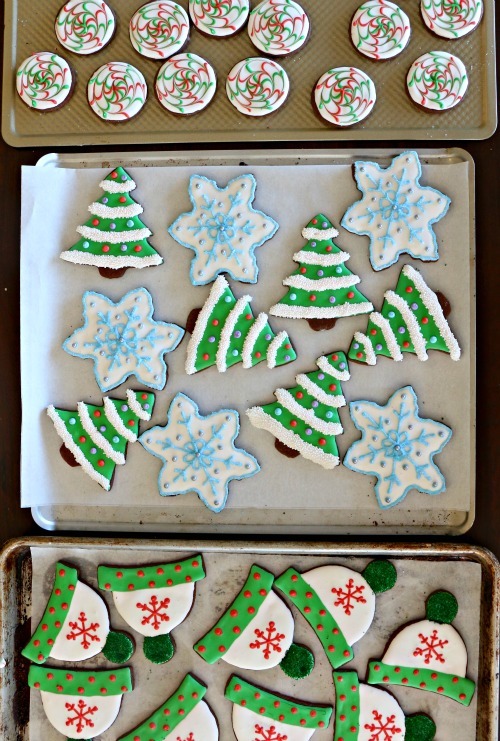 Cool cookies on baking sheets 10 minutes then carefully transfer to wire racks to cool completely before decorating. In the bowl of an electric mixer fitted with the whisk attachment, beat sugar and meringue powder on low speed until well combined. In a measuring cup, preferably with a spout, mix together water and 1 teaspoon extract. Increase mixer speed to medium and mix for 4 minutes, stopping to scrape down sides of bowl as necessary. Increase mixer speed to high and beat for about 3 to 5 minutes more, until icing is stiff, glossy and the whisk attachment can stand up in the icing without sinking. 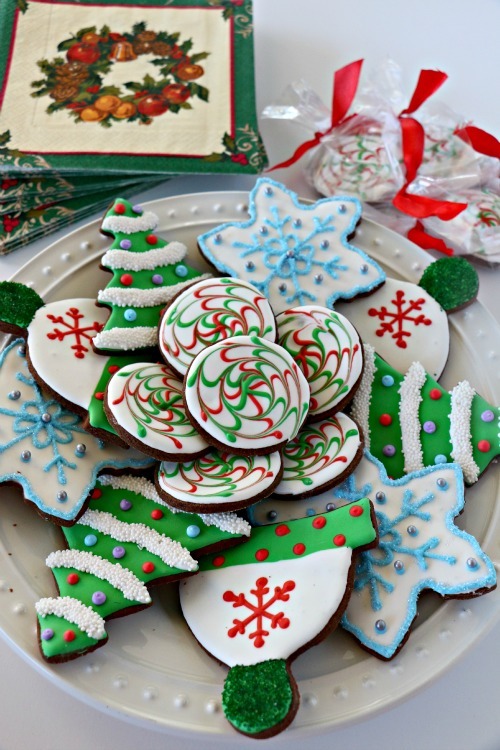 Divide icing into bowls and color with gel paste or food coloring as needed. 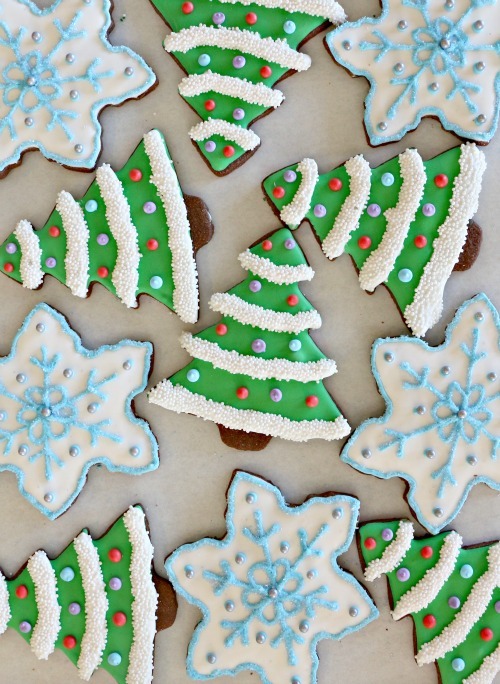 Decorate your cookies!